So, I think it’s been a couple months since I’ve blogged, sorry about that. I’ve had good intentions, but those don’t bring results, do they? Alfalfa after a hard freeze. The biggest topic for everyone in the last couple of months has been, in my opinion, the weather. Matt and I get our weather out of Amarillo, TX, along with our local stations. The weather man on one of the stations said it the best when that last freeze came. He called it “weather whip-lash.” What a way to say it! We had three consecutive weeks in April where it would be 80-85 degrees on Monday, and by Wednesday night it would be 29 degrees. Needless to say it did damage our wheat and alfalfa. To what extent is still to be seen. Saturday night, May 18, we received a ¼ of an inch of rain/hail mix. The rain was great, but I don’t think we had enough hail, or big enough, to damage the wheat too much. Jake pushing the calves, Matt and Gary catching the calf in the calf cradle, and Xander in the background loading the ear-tagger. I think all the cows have calved. Jake and Matt brought the first-calf heifers and some young cows in this week and worked the calves. They said one calf had literally just hit the ground when they went out there. The cow was still licking it clean. They left them in the pasture and went back for them later. The cows and calves then were taken up to Kansas to pasture for the summer. We don’t want to over-graze our pastures, so we have some relatives that watch them for us through the summer. I know we lost three calves from the heifers. Two of them got stepped on by the cows during those cold spells when they were all huddling together. It’s sad when it happens but it is rare. The guys will bring the rest of the cows and calves in this week. They will vaccinate, brand, castrate (bulls only), and put in ear tags in all the calves. I think we have around 210 heifers and cows, so the guys have a big job on their hands. And yes, for any of you wondering, we do keep the calf testicles and I do fry them up for the guys. It is not something I grew up doing, so I had to ask around for a “recipe.” So far they’ve been good! The alfalfa is looking good – a little curled on the top from the freezes, but I don’t think it will affect it too much. I reminded Gary the other day, we actually did our first cutting of hay the first Friday of May last year. Which was the earliest I had ever help cut hay, but it got hot early last year, too. I think the first cutting of hay will be in the next week or two. I saw some blooms on the field next to the house. We have four irrigated alfalfa circles, and the corners are dry-land. Last year we did not get enough rainfall for the corners to be cut at all. They look hopeful so far. Cattle grazing on one of the Graves’ irrigated wheat pastures. Some wheat looks okay and some not-so-okay. The yields at the end of harvest will tell us best how much the lack of moisture and the hard freezes have affected it. I did look at a wheat head last week on the irrigated circle and it looked hopeful. Last year we started cutting the last week of May, but I don’t think we’ll start that early this year. The kids and I missed the first week of harvest because we traveled with my parents from Kansas to Iowa to visit both set of my grandparents. Needless to say, that didn’t go over well when the main cook on the farm leaves at a very busy time, ha-ha, but they let me come back without too much grief. We unfortunately will not get to make that trip this month. I am hoping that maybe in September we might get away to see my grandparents. Gary has been busy spraying and top-dressing wheat and alfalfa. We had the aerial sprayers spray the fields last weekend for weevils. They kids enjoyed the airplane getting close to the house. Jake and Gary also freeze-branded the heifers and the young cows about a month ago. If you’re not familiar with that process of branding, it is branding using dry-ice and not a hot brand. It lasts longer and makes it more suitable to use on cows that you will have for several years. Jake welding together panels for new corrals. Matt and Jake have also been busy with moving our feeder heifers off of pasture and taking them to the feedlot. Matt picked out of our home-raised heifers the best ones he liked for replacements for our cow/calf operation. Another 25 head of the home-raised heifers were sold to Gary’s nephew and wife. I’m not sure if they are going to use them in their cow/calf operation or just feed them out. After the heifers were moved that made room for all the calves from the sale. Since January the guys have worked about 475 head of bulls and steers. According to the papers, most of them were supposed to be steers already, but on one bunch 90% were bulls. That made a long day for the guys. The guys cut all the bulls that we put on pasture or feed in the feedlot. That makes for a better-tempered calf and keeps our people safe in the industry. It could be one of us, an employee at the local feedlot, or the individuals at the slaughter house. And it makes for a better-tasting end product, which is beef in your grocery stores. We even test our own product every day. We have one of our calves fattened in the feedlot and then slaughtered to fill the freezer. The yard-work is in full swing, too. When Jolena’s not at work or helping the guys with endless tasks, she is on the mower. With the addition of her and Gary’s new home almost two years ago, along came more yard to mow. They planted a beautiful yard. I am busy getting flower beds weeded and planting my vegetable garden. Matt and the kids help in the process. We have garlic, onions, peas, potatoes, and strawberries planted. We hope to get the rest in this week. We are getting over-loaded with pets. We have the five ducks, and then we now have 13 chickens. Twelve of them we bought at Atwood’s in Woodward, and the last chick was brought home from Xander’s Kindergarten class. They hatched out over 140 chicks in an incubator in their classroom and the students we allowed to bring one home if they wanted to. Our recent addition this week has been two litters of kittens given to us by a friend. That made a total of 9 kittens, but we gave one to Matt’s nephew. We tried to give a few more away, so we have a few spoken for now. Matt, Lisa, Xander, and Keira celebrating Easter at Lisa’s parent’s house. Xander is finished with school. He had his Kindergarten graduation May 17, and had a great time! He has started his first year of T-Ball and is enjoying it! Keira and Xander started up their Harper County Round-up Club play days last Monday, also. It’s going to be a busy summer, as usual! We also have some very exciting news! I’m expecting Matt and I’s third baby! I am almost through the first trimester and so far so good! Today, May 20, is nice and cool and it’s even sprinkling a little. The guys are bringing in the rest of the cows and calves and it’s so loud from the cows and can’t hear myself think! Time flies when you’re having fun. It seems like yesterday I was writing last week’s blog. 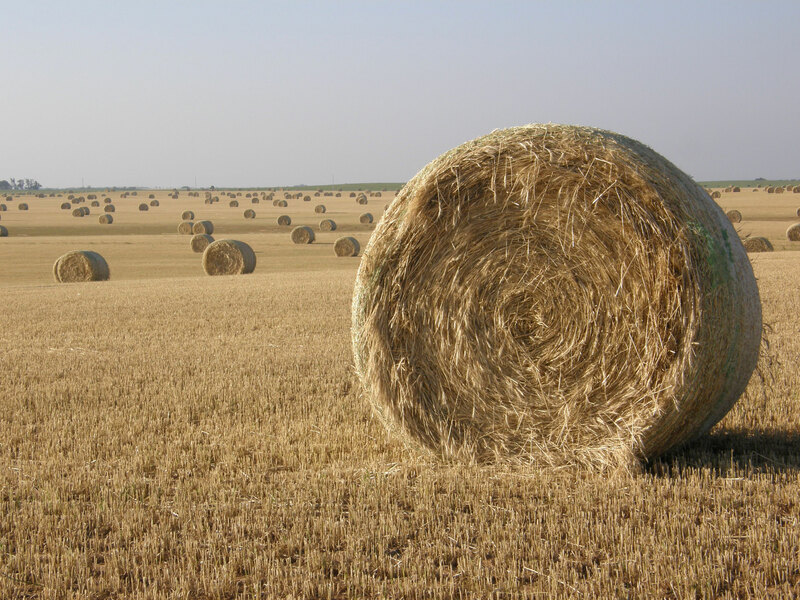 We finished our last custom wheat hay baling this week and brought our custom rye wicking to a close also. We got a couple more sets of cows and calves worked and look forward to finishing up the rest of them next week before harvest begins. We have three more sets to go and spent some time this weekend getting them moved a little closer to the corral. 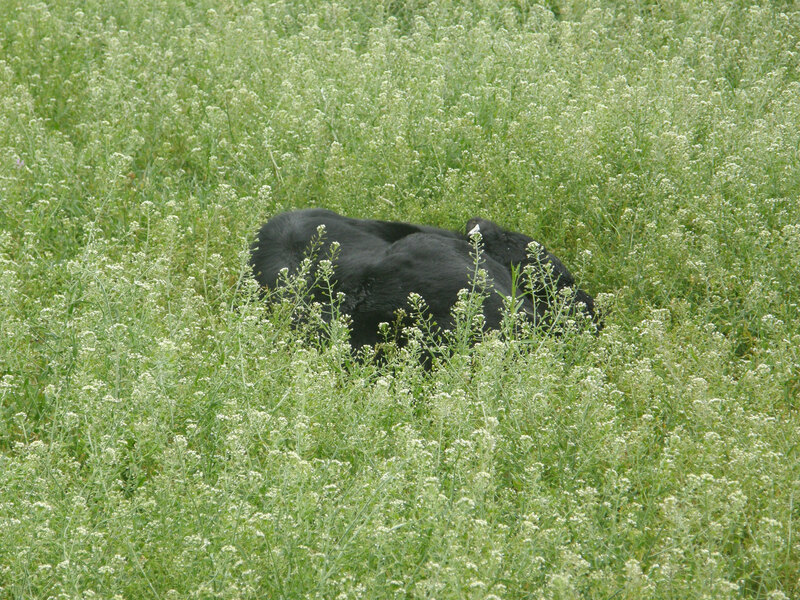 A baby calf hiding in the grass. This weekend will probably find the combine creeping out of the barn for its pre-harvest maintenance. Things were running fine when we pulled out of the last milo field last fall so I don’t expect anything major will need to be done. We will change the engine oil and all the filters, grease and lube everything, and give the whole machine a very thorough inspection before heading toward the wheat fields. Brandon and Wade working on the rake. Clayton and Wade replacing wrap in the baler. It doesn’t take long to look around and be thankful for the moisture we’ve had this spring. The green in the pastures is certainly a nice sight to behold. It certainly renews my faith. As I was learning to drive a tractor, my Grandpa went from sitting with me on the tractor to sitting at the edge of the field in his pickup while I worked the ground. I was 12 years old when I was turned loose in the field by myself on his John Deere 4020 tractor to work ground. I thought I was certainly closer to becoming a man than ever before when that day occurred. I look back with such fond memories on the days that my dad and grandpa were teaching me and trusting me with the responsibilities that come with growing up working on a farm. I still remember the struggle of learning how to shut a wire gate the my dad made it look easy and how to throw down a baby calf that weighed twice what I did. Through all of the lessons and instructions, I think what stood out the most was to never give up. Even when mistakes and shortfalls were made, I was encouraged to try again and give it my best. I feel very blessed to have had parents and grandparents who took the time to teach me to work. As I reflect on the last 12 months of the worst drought that I’ve experienced, I think that the building blocks I was taught from early on are at the foundation of why I persevere as hard as I do to be successful here on our operation. As long as I remember, I’ve been told stories of past perils that confronted the generations that came before me. One thing in common was that they never gave up. Through faith in God and the willingness to work hard they overcame what seemed at times like hopeless situations. I am proud to carry on and hope that I can instill in my sons the same reverence for what we do as I have. I once heard that if you find a job you love, you’ll never work a day in your life. Time flies when you’re having fun.